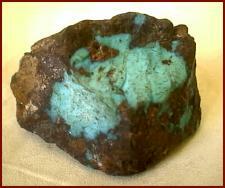 Persian turquoise comes from a number of mines in modern day Iran. The stones from all mines show a great color variation. Many mines were worked around Nishapur, 225 miles east of the southern end of the Caspian Sea, close to old caravan routes. Firm evidence exists that these mines were heavily worked beginning in the 10th century, but there is also evidence that some of the mines near the surface may have been exploited as early as 2100 B.C. The Persians divided turquoise into three classes. Fine ring stones were called Anqushtari. Stones of intermediate quality were called Barkhaneh. Stones that were pale, greenish, or with spots from the matrix were called Arabi. 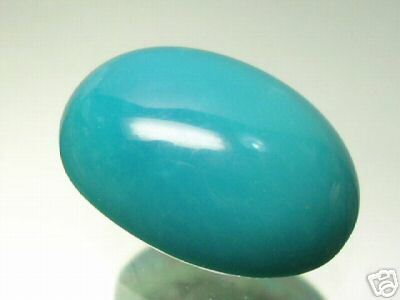 Traditionally, brilliant blue stones with no matrix were preferred in the Middle East. You could say this was the original Sleeping Beauty Turquoise. Today, Persian turquoise in a variety of shades and matrices can be found in jewelry and appreciated for its classic beauty. These stones adorn some wonderful men's turquoise bracelets, pendants, rings, and earrings. Throughout the centuries, the intense sky-blue Iranian turquoise, known as Persian turquoise, has been the most sought after. This is a clear, even blue color with no evidence of green, nor any signs of black veins. As recently as the 70s, top-quality turquoise was fetching prices of $2,000 for a 15x20mm piece. Hard to believe? Did you know that no English gentleman of the 17th century was regarded as well dressed or well adorned unless he wore jewelry of turquoise? This stone was so highly valued that all 79 of the emeralds in the crown that Napoleon I gave his consort Empress Marie Louise were replaced with Persian turquoise cabochons.